They ate just two teaspoons of tuna and one biscuit every two days, washing down their "meals" with a small sip of milk. For the miners buried alive in the depths of a gold-and-copper mine in Chile, the meager rations probably didn't silence their rumbling stomachs, but they did help keep them alive for an incredible 17 days until the outside world learned the good news: against most odds, all 33 miners were still alive. "Estamos bien en el refugio los 33," they wrote in a note attached to the end of a probe. "All of us are well inside the shelter." Those first words came after several unsuccessful attempts to drill down and reach the miners, feared dead since the Aug. 5 collapse of the facility, located about 530 miles (850 km) north of Santiago, Chile's capital. In those first moments after they were discovered, the men peered eagerly into a camera lowered to reach them more than 2,000 ft. (600 m) below the surface, their eyes blazing with euphoria. Among their first requests: toothbrushes. Now that rescuers have successfully drilled a second bore hole into the cavern, the 6-in. (15 cm) portal will serve as an umbilical cord delivering food, water, medicine, oxygen and even entertainment to the men as they wait an estimated three to four months for rescuers to drill a hole large enough to carry them to the surface. 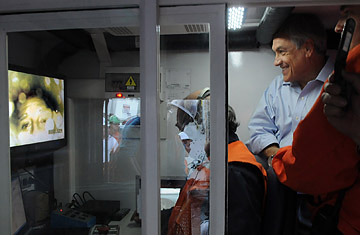 The miners have spent the past few weeks inside a shelter measuring about 500 sq. ft. (45 sq m), no larger than a small studio apartment. Davitt McAteer, who led the federal Mine Safety and Health Administration under President Clinton and is currently leading an investigation into the Big Branch mine disaster that killed 29 coal miners in West Virginia earlier this year, compares the space to a jail cell or a submarine. "It isn't luxury by any stretch of the imagination," he says. "Imagine yourself in your office and say, I want to stay here for 18 days. It's a feat of untold heroism that they were able to pull it off." So how did the miners survive amid sticky 90°F (32°C) temperatures and blackness (save for the lights on their helmets, which they kept charged by using the battery from a work truck)? To begin with, the shelter  though not lavish  provides a larger air space than the smaller shelters often seen in coal mines in the U.S. Many of those shelters stand just 5 ft. (1.5 m) in height and 20 to 30 ft. (6 to 9 m) wide, says John Urosek, chief of mine-emergency operations for the Mine Safety and Health Administration. The trapped miners were also at an advantage because metal mines inherently provide a safer atmosphere than coal ones, generally free of methane, a harmful gas found in coal mines. "The oxygen in a metal mine is only going to be depleted by the people breathing themselves," Urosek says. Though the size of the shelter may have given the men a leg up, stretching emergency supplies that were intended to last just 48 to 96 hours is a feat credited entirely to the resourcefulness of the miners. In addition to rationing their food supply, they fashioned a makeshift water canal by digging for groundwater and siphoning off additional water from the radiators of the machinery. Another issue is an unpleasant one. Given the size of the structure, the men are most likely able to keep a distance from the area they chose to use as a makeshift restroom. Still, with the number of men trapped, the risk of a disease like dysentery is significant. Luckily, now that the miners have outside contact, medicine and sanitation materials can be sent into the mine to mitigate some of the concern. So far, only one man has reported having stomach problems. But while food, water and air are the immediate concerns, the weeks spent buried and unsure of rescue undoubtedly cause mental stress. Yet the miners appear to be in good spirits. On Aug. 23 they sang the Chilean national anthem as rescuers sent down oxygen capsules, glucose and rehydration tablets meant to restore their digestive systems. And though the miners have not yet been told it could take as long as four months to bring them to the surface, Chilean President Sebastián Piñera asserts, "They'll come out thin and dirty but whole and strong." But there's no denying that a near-death experience can take a toll, according to Joe Sbaffoni, director of the Pennsylvania Bureau of Mine Safety, who helped secure the 2002 rescue of nine miners who were buried for 78 hours in the Quecreek mine. "There's no question they probably all felt they were going to die," he said. Of the nine Quecreek miners, three returned to work at the mine. Two work above ground. Only one man, Randall Fogle, went back to work underground. He is now the mine foreman. "That situation  it changes you," Sbaffoni says. Now that the miners have been found alive, rescuers have the precarious task of digging them out through solid rock in shaky ground that has already proved vulnerable to collapse. Though the impulse would be to drill down speedily through the rock to reach the men as quickly as possible, doing so could result in the roof collapsing further on the trapped miners. "It's going to have to be done with patience and with prudence," McAteer says. If the rescue goes as hoped and the men are able to reach the surface, they could be home just in time for Christmas. But as McAteer cautions, "We're not home yet." He adds, "And it won't happen without a call to the spiritual leader of us all."